New Style White Kitchen - Scandinavian, Of Course! Just when you thought there could be no more true innovations in kitchen cabinetry, I mean, you open a door and you close it. You open a drawer and you close it. What more could there be to that concept? How about this combination of little recessed spaces set amongst the cabinetry? I spotted this on the teriffic blog, Emmas Designblogg. Whether the recessed nooks are used for decorative or useful items, I think this is a fun idea. While you're at it, check out this link from Emmas blog too. Images are from Skona Hem. What do you think of this style? KBIS 2008 Trends - It's a Mod Mod Mod Mod World! For those of you way too young to remember this movie, if not a mad world, it was a mod one at KBIS. Here are some examples, certainly not all, and to see the brand, roll your mouse over the image. MUCH more KBIS to come (this is nothing!) We haven't even seen kitchens yet! I don't think I'd call fellow blogger, Leah, a slacker, even though her blog is named More Ways to Waste Time. I think Leah's efforts definitely look productive, and with some "chic" thrown into the mix. A freelance writer, Leah interviewed me some months back for a piece on kitchen faucets for HGTV's website, yet to come out. Her point of view on home design, I find to be fresh! Leah went on a walking tour of homes in California's Oakland hills. The homes were "eh", she needed a drink, but it was the last home her tour group went into, which was the surprise of the day. The kitchen stopped ME cold, when I came upon these images, and she said everyone was just wow'd. Simple, elegant, modern, yet, to me, warm. I really love this kitchen. Things I'd tweak: The window doesn't do it for me in this setting, but my guess is the owner wanted the home to stay true to its architecture. I don't get the round thing to the right of the hood. Maybe I'd add a run of stainless steel above the tile to go up to the height of the window, as I feel that's an awkward area, below the window. The window is too high. Just, sort of, to integrate the window in a more meaningful way. I'd revisit the plan. The cooktop/oven is unfortunately in a corner. Maybe they could have been centered on the beam...just random thoughts. Overall, very, very nice. Here is a collection of modern kitchens, snapped at the kitchen show a few months back in Las Vegas. I have not put these images up till now, and it's interesting to compare them with the Scandinavian modern kitchens I just photographed in August. 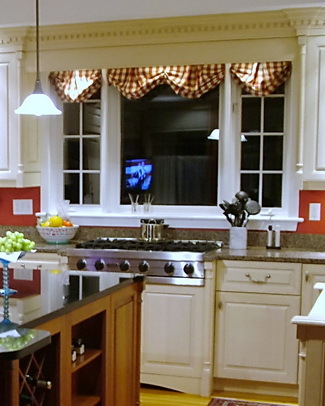 Some of these kitchens were made to showcase appliances, and some were showcasing cabinetry. Perhaps you can see that the trend of tile walls is strong. A bright color trend is seen, as well as dark shades of cabinets in these images, also strong. Quite frankly, I think some of these are uninspiring, at least to my eye, a few others are good, and the second to last image is a great example of just way too much going on...putting different materials together just because you can! One of my favorite blogs, freshome, was interested in the kitchen "scene" in Copenhagen, which I have not yet shown on this blog. I went to a good number of kitchen showrooms, every single one of them having wonderful looks and features within. Some features and styling are very subtle, almost imperceptible as being something special, unless pointed out, making the look all the more...I think "organic" is a one descriptive word, following Denmark's great, and historical, tradition for design excellence. So, I encourage you to look closely at these images in the flikr slide show. Here is what I observed, which I shared with freshome, on that blog: "I LOVED going to Copenhagen's kitchen showrooms, seeing the latest, and very cool, design ideas. Large patterns on walls, beautiful, and textural wood grains, lots of dark charcoal or black, and white, cabinetry, these are some of the latest trends in kitchen design. I also noticed backsplashes with clear or colored glass sections positioned over painted, textured, walls, a very sleek look! Always fabulous lighting and always little splashes of color, a typical, and modern, Scandinavian touch." Some of these trends are prevelent in the U.S. as well, as I observed at KBIS in May. I will do an accompanying post on those kitchens in the next few days. That should be interesting to compare! You will see a few country kitchens, too, very charming, I think. And, please take a look at the freshome blog, and click on the top banner for the latest posts. There is much inspiration throughout this blog for the entire home. Enjoy! Here are some modern kitchens from Metropolitan Home, which came in the mail yesterday. It's a great issue...go out and pick up your copy. Meanwhile, I would love to know your thoughts on these kitchens. The last post really hurt me. Everytime I looked at it, and I'm not kidding, I had anxiety! The yellow, the orange, the brown...the pain was almost unbearable. And, I can't wait to do it again! So, now, for something a bit more current. Come with me, mod design fans, back to the future, and take a trip to Europe, (I'm not paying) in design style only, to where modern furniture design, truth be told, has its origins. In Scandinavia, in Denmark, to be specific. Here's my good friend, Lone's kitchen. Lone (pronounced Lona) Bager is the owner of Kobenhavn Design, kobenhavn design, a to-the-trade supplier of modern Danish cabinetry, including wood countertops. Lone is based in New York City, in the east village, and operates out of a fabulous design studio. The philosophy of Danish design is that there is beauty in the "whole", as opposed to the individual pieces of the whole. The phrase "less is more" was invented just for this concept. It's about function, simplicity, and therefore, beauty. Note the simplicity and elegance of the cabinetry in the dining area behind the table in the second to last image. Pure function in classic proportions. The beauty lies in restraint. It takes a lot of discipline to allow this type of design to just "be". It's not so much modern, as timeless. Love it. 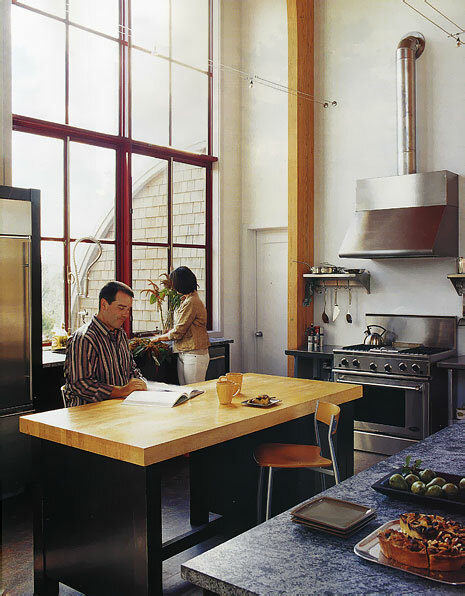 The cabinetry, affordably priced, is multiform and is available "to the trade" via Lone.